Purchase of Residential Plots in Dholera is gaining momentum as development in the smart city is marching ahead with full vigor. Foreign investors are as keen as Indians to park funds in Dholera real estate market with an anticipation to earn larger than life returns from the biggest Greenfield project in the country. Not only is Dholera being developed 6 times the size of Shanghai but is also progressing at rapid pace making it the fastest developing city in India. Growth of property markets in Dholera is inevitable which can be attributed to cheaply priced land, progressive economic development and top class linkage with cities around the world. Dholera international airport has added further to the charm and made the city popular amongst global investors and industries. The airport shall be constructed 20 Kms from the smart city across 1,700 hectares of government owned land at a project cost of Rs. 1,378 crore. While purchasing a plot in Dholera, one should check whether the plot is being sold vis-a-vis Carpet Area or Super Built Up area. In Dholera, the latter is more common and price shall be quoted 35% cheaper than when sold on Carpet Area basis. Over 30 developers have started building residential townships in all sizes on the outskirts of Dholera in villages like Navagam, Pipli, Ratanpur and Valinda. As and when development shall pace ahead in Dholera, one can expect an increasing number of residential plots being offered within the city premises as well. 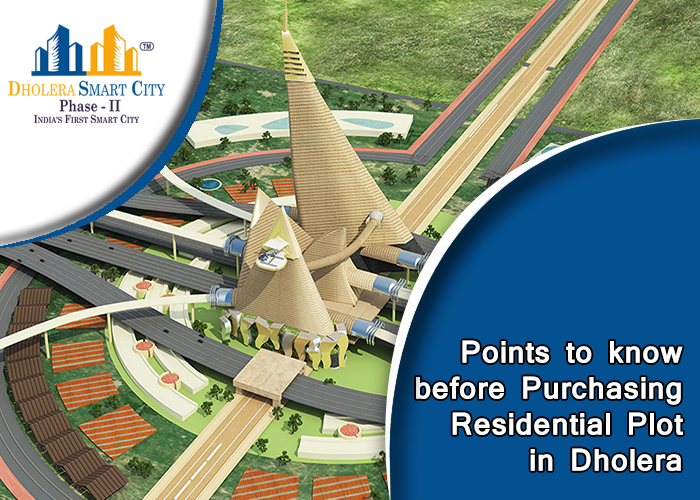 Investors should note that an equal ROI can be expected on plots bought within and outside Dholera. Under every circumstance, the plot must be physically verified and progress of the site checked by the purchaser to ensure the genuineness of the deal. If possible, one should also ask for contact details of other purchasers who have bought properties in the vicinity to double check the plot offerings. The developers is required to provide a list of amenities to the buyer at time of purchase which can be used later to cross verify the actual facilities against those promised in the list. To ensure legal sanctity of the property, the buyers are advice to go demand for and go through the legal documents in details. These include government documents like number 6, 7/12, 8A and last 50 years land records and other papers such as plan pass copy, NA and clear title. Dholera is tempting many who wish to double or triple their funds but are certainly recommended to follow the above checks and measures prior to making any purchase.